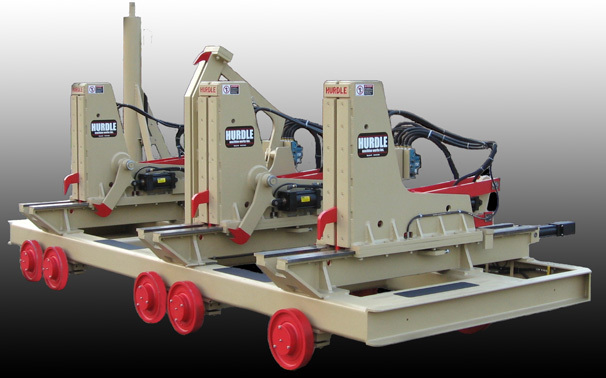 This Magnum Carriage line consists of simple, heavy duty tong dog carriages. Its so simple, you won't believe it! We know there are other tong-dog carriages out there, but rest assured, our tong dog design has been tweaked for performance that you won't find anywhere else. Available in setshaft (Magnum LT) for Hurdle sawmills, heavy duty setshaft (Magnum LS) for larger mills, or linear (Magnum LP) for large, custom mills, we have a Magnum carriage for any size mill. This carriage works well with larger logs. Its simple design will produce for years to come with little maintenance. We believe the Magnum carriage design is hands down the best carriage design in the universe! Magnum Carriage for cutting ties, pallet lumber, and custom products up to 12' in length. Very fast. Magnum Carriage for cutting grade, ties, sending cants to resaw, or specialty products up to 16-18' in length. Very versatile. Magnum Carriage for cutting mat material, long timbers, or other specialty products up to 30' in length. 1 15/16" diameter setshaft with roller chain driven knees (#100 chain) - The (Patent Pending) simplest, strongest knee drive system out there! 2 3/16" diameter setshaft with roller chain driven knees (double #80 chain) - The simplest, strongest dogging system out there! For setshaft models, choose NanoSet or ComputerSet. For linear carriages a variety of controls/scanners are available from multiple vendors. Available for Magnum LP and LS. Built-in to Magnum LT.